Children’s crossing - part of the road with stop lines marked and ‘Children Crossing’ flags mounted on red and white striped posts on either side of the road. Marked foot crossing - part of the road with pedestrian facing lights and traffic lights, indicated by a different road surface or two parallel lines or rows of studs or markers. Pedestrian crossing - part of the road painted with parallel white stripes and indicated by a pedestrian crossing sign (walking legs symbol), with/without flashing yellow lights. The marked road portion where pedestrians cross at a crossing of any kind. The area between the crosswalk line and any vehicle stop lines is not form part of the crosswalk. Figure 1: The yellow-shaded area indicates the crosswalk. 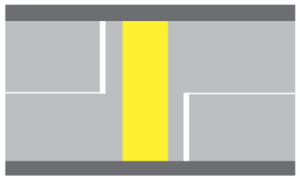 A lane change/merge or lateral movement in an un/marked lane of at least a car width. A change of course/speed by another road user to avoid a potential collision with the applicant’s vehicle (e.g. swerving, stopping, slowing or accelerating). The applicant looks back over their left or right shoulder through their side windows (not the rear) to check for other road users in blind spots not seen in the mirrors. A portion of the road intended for a single line of traffic. The boundaries may be defined by pavement markings (lane, centre or edge lines) or by the kerb, the edge of the sealed road surface or the centre of the road. Movement sideways or from side to side (differs from forwards and backwards). The driver or rider of a motor vehicle or the rider of a bicycle or a pedestrian. Includes motor vehicles (cars, trucks, motorcycles, etc. ), bicycles, and pedestrians. Changing direction from one road into another at an intersection. Not including driving around a curve or bend when continuing on the same road. There are 4 types of assessment items used in the Drive Test. Assess 1 aspect of driving performance during a specific, assessable driving task at a specific location (e.g. Observation might be assessed when turning from Smith Street into Jones Road). Task Assessment Items are not assessed between assessable driving tasks. They contribute to the applicant’s score for Stage 1 or 2. Assess an aspect of driving performance (either Control or Lateral Position) during assessable tasks and linking manoeuvres throughout Stage 1 and 2. They contribute to the applicant’s score for the relevant stage. Critical Errors are recorded whenever they occur (not just during assessable driving tasks). They are recorded if an applicant makes a serious driving error (including illegal action) that does not meet the conditions for an Immediate Termination Error (e.g. a Critical Error is recorded for failing to signal before changing lanes when there are no other vehicles nearby and no dangerous situation is created). The Drive Test will be terminated immediately (and a ‘Not Successful’ result recorded) if the applicant commits more than 1 Critical Error during Stage 1 or more than 2 Critical Errors over the course of the entire test. For example, an Immediate Termination Error is recorded for failing to give way to another road user when turning. The applicant is not considered to have caused another road user to take evasive action if the other road user’s action was unnecessary. An Immediate Termination Error committed at any time during the test will result in immediate termination of the Drive Test.